This is beautiful! 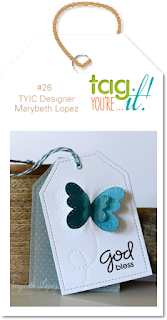 Thanks for joining us at Tag You're It! A gorgeous, uplifting tag, Julia! The feather is an intricate, delicate beauty! Thank you for sharing your creativity in the Tag, You're It gallery! This is so charmingly gorgeous. 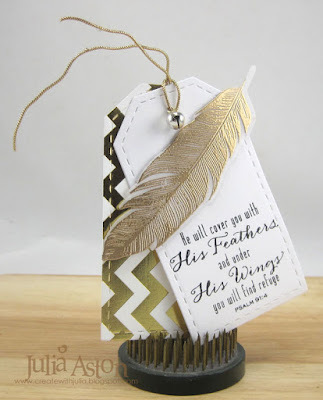 That big gold feather goes perfectly with that foiled chevron. Lovely! Julia this is such an inspiring tag creation. Just adore the feather. WOW....what a wonderful tag! 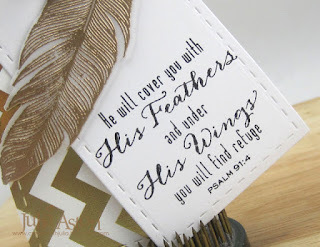 Love your stamped inspiration with those feathers, simply stunning. Julia you know I love everything about this tag, the sentiment the feather and the bell! Oh my gosh this is wonderful (life)!!!!!!!!!! Thanks for joining us at Tag You’re It, friend! What a comforting thought I feel often. Julia, always love seeing your take on any challenge. Your insight on this one tickles! And honestly, from the thumbnail, I thought it was a real feather! The bell is delightful, and I can almost hear it from your description! Thank you for once again joining in at TYI! Beautiful golden feather and the background! So tender and delicate and solemn at the same time! Wow! Gorgeous Julia! Love all that shiny gold - total eye candy girl!